The former chairman of the Nato Military Committee has warned that Denmark risks losing "visibility and influence" in the military alliance due to budget cuts and decreased capabilities. General Knud Bartels, Denmark's former defence minister and the recently-replaced chairman of the Nato Military Committee, warned new Defence Minister Carl Holst that Denmark's relevance in Nato is threatened by holes in the defence budget and “a growing discrepancy between [Denmark's] ambition level and [its] ability to contribute” to the military alliance. Berlingske newspaper obtained and published a two-page letter sent by Bartels just before he ended his term at the head of the Military Committee in June. 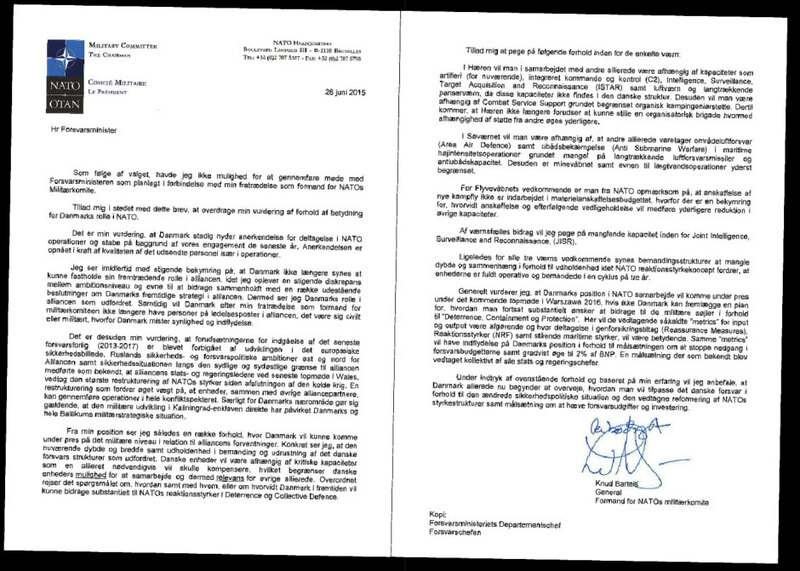 In the letter, Bartels expressed concern about Denmark's planned military spending, which he says fails to keep pace with growing Russian aggression. The former defence minister warns his successor that “the changing security policy situation” and coming changes to Nato's structure threaten to leave Denmark on the outside looking in. “I see Denmark's role in the alliance as challenged. At the same time, Denmark will after my retirement as the chairman of the Military Committee no longer have people placed in leadership positions in the alliance, neither military nor civil, thus missing visibility and influence,” Bartels wrote. According to Bartels, Denmark's Nato partners are worried that Denmark's coming massive purchase of new fighter jets will result in cuts to the nation's defence budget. He also wrote that “Denmark's military level could come under pressure from the alliance's expectations”, especially when viewed against “Russia's security and defence policy ambitions east and north of the alliance”. When Nato holds its top meeting in Warsaw next year, Bartels said that Denmark will be under massive pressure to present a plan for significant military contributions. Holst has already said he supports more spending on the military and government support parties the Danish People's Party (DF) and the Conservatives urged Holst to heed Bartel's warnings. “We have an idea that Denmark should be a safe and secure country with a good defence, but we aren't because our defence lies in tatters. We haven't used enough money for a long time and we have chipped away our capacities,” DF spokeswoman Marie Krarup told Berlingske. Rasmus Jarlov of the Conservatives told Berlingske that Bartels's letter reinforces the need to spend more on Denmark's military capabilities. “The navy needs ships and submarines, the air force is missing surveillance capabilities, fighter jets and anti-aircraft defence while the army is missing combat vehicles, trucks and artillery. It's hard to say who is missing the most,” he told Berlingske. Holt declined to comment specifically on Bartel's letter but told Berlingske that he “listens with great interest to all viewpoints”. Holt also pointed out that the there are commitments to invest some three billion kroner annually in new military equipment while another three billion is spent each year on maintenance.